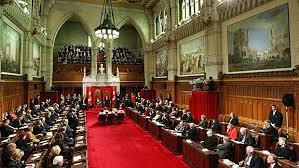 Modeled on the British Parliamentary system, the Senate is one of two Houses of the Canadian Parliament. It serves as a house of sober second thought to Parliament’s lower house, the House of Commons (House). Unlike the House of Commons, where elected Members of Parliament serve, appointed Members (Senators) serve in the upper chamber. The Constitution Act (the British North America Act) of 1867 governs the legislative limits of the Senate. The Governor General appoints Senators on the advice of the Prime Minister. Until 1965, appointments to the Senate were for life, but that year an amendment changed this provision to the age of 75 for a Senator. Over the last several decades, the Senate has faced challenges over its role in today’s political system. Arguments prevail to make the Senate an elected body, where Senators serve fixed or unlimited terms similar to the House. Other arguments draw criticism to the number of Senators allocated to each region or province, pointing out that there is poor representation by population in the current arrangement. The cost of maintaining the institution has become another criticism for some Canadians. Senators receive in excess of $130,000 per annum as a base salary. At a time when western governments encourage austerity, successive Canadian Governments have continued to pay to operate the Senate. Simply taking the base salaries into consideration with 105 Senators plus their expenses, the upper house costs taxpayers millions of dollars a year. In addition to the cost of meetings, Canadians have questioned the democratic legitimacy and utility of the Senate and its unelected representatives who have demonstrated poor judgment regarding expense claims recently and who tend to be partisan appointments for party loyalty by whichever party is ruling. The National Citizens Alliance believes that the Senate should serve its purposes in Parliament, which includes acting as a check and balance on the House, introducing Bills or reviewing and amending Bills from the House in the legislative process, and performing committee work to study economic, legal and social issues in Canada. Yet, the NCA only supports this role if the senators are elected. However, the NCA believes that the Canadian people via a binding national referendum ultimately should decide what to do with the Senate. The National Citizens Alliance believes that referendum is a viable and necessary option because Canada’s elected officials have demonstrated over several decades that they are unable to resolve Senate issues, and the Canadian people should have the final say over significant issues that affect all Canadians. The NCA would respect the Canadian people’s decision, as expressed in a binding referendum, to abolish the Senate. The National Citizens Alliance supports holding a legally binding referendum as soon as possible. The binding results would direct the Parliament conclusively over maintaining the status quo, pursuing Senate reforms – as afforded through Article 44 “Amendment by the Parliament” of the 1982 Canadian Constitution Act, or abolishing the Senate making a unicameral (single chamber) Canadian Parliament. The NCA will work with any party willing to carry out the democratic wishes of Canadians according to results of a binding national referendum. On March 2, 2014, the NCA membership voted 83.3 percent in favour of citizen-initiated recall of Senators whether they are elected or unelected; 16.7 percent of the NCA membership voted against recall of Senators. The passing policy threshold is 70 percent. ● Senators whether elected or unelected to the Canadian Senate will be subject to citizen-initiated recall. ● 15 percent of a relevant province’s electorate is required to initiate a recall vote. ● The recall vote requires at least a 50 percent quorum of the relevant province’s electorate, and 50 percent plus 1 support of the electorate to recall a Senator. The electorate cannot initiate a recall until 6-months have lapsed from a Senator’s appointment or election to the Senate. Further, citizens have 6-months to attain the 15 percent support from the relevant province’s electorate in order to trigger a recall vote. ● Recalled Senators have no restrictions on whether or not they run again as a Senator or whether or not they are appointed again as a Senator. The NCA membership voted on 2014-02-28. 83.3 percent of the voting membership voted in favour of Senate Reform vs. Abolition Policy Statement with an 83.3 percent quorum. This result satisfies the minimum 70 percent membership support and 50 percent quorum required for adoption of policies as per the NCA Constitution.